The Lexmark E260d space-saving, monochrome laser printer includes duplex printing standard and a single-sheet priority feeder. 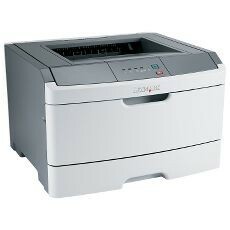 The affordable Lexmark E260d, with its powerful 400 MHz processor and 32MB of standard memory, provides high-quality printing at a speed of up to 35 ppm on letter-size paper. A fuser that warms up instantly and time to first page as fast as 6.5 seconds increase efficiency. The front-loading supplies and the optional addition of an additional paper drawer increase the ease-of-use. This versatile printer supports various media types and sizes. The easy-to-use Lexmark E260d is an excellent printing solution for price-sensitive companies and individuals.